This beautiful Scandinavian timber-framed home, complete with a stunning green roof, is located on the very western edge of Europe. With heather-backed mountains on one side and windswept white sands on the other, this Atlantic Ocean island is the home of Harris Tweed. The property even boasts its own private beach on the western coastline. 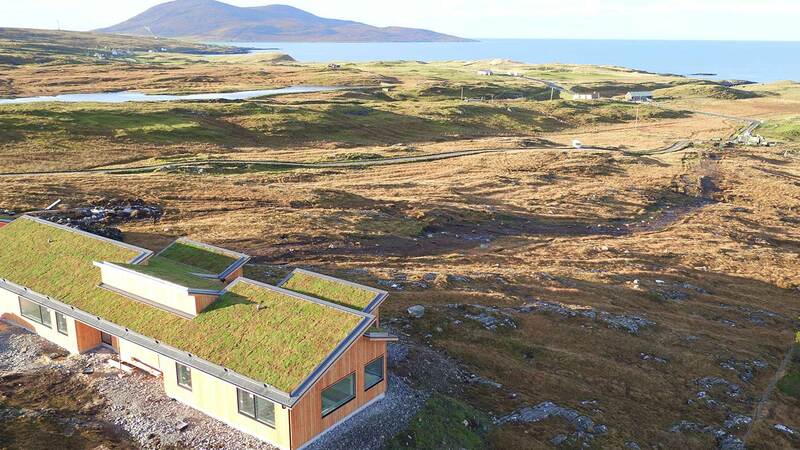 Fjordhus contacted Optigreen and Bridgman & Bridgman to design and install a pitched green roof system on a timber-framed home on the Isle of Harris, Scotland. The house and garage are topped with a series of 20-degree pitched roofs. SRS Projects (Scotland) Ltd installed the waterproof membrane. Due to the size of the site, the building project required 90% of the island's scaffolding during construction. For Bridgman & Bridgman, the project was 650 miles away from their HQ in Milton Keynes; some 17 hour journey which included ferry crossings. Phone signal is extremely limited, and contacting suppliers and the office involved a 20-minute drive to a high-level area to get signal. Sending materials from the UK mainland often took 3-4 days travelling time. The roadway up to the house was constructed from local rock, but unsuitable for HGVs; and a Telehandler was required to bring all the materials from the island road up the mountain face to the work area. Strong winds of up to 95 miles per hour were experienced during Bridgman’s time on the island and many days were lost and work halted due to severe gales and driving rain. 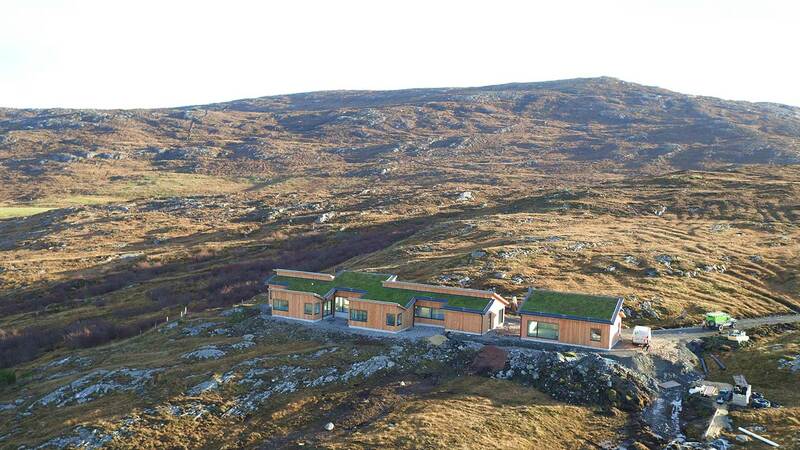 The roof and vegetation needed to be able to cope with the high sea salt levels and winds measuring over 120mph, which the island have previously experienced. Three articulated lorry loads of material were delivered to the island containing some 30m3 of substrate and 21 pallets of pre-cultivated sedum mat. Since completion the house owners report that Golden Eagles and White-tailed Eagles frequently visit the roof. 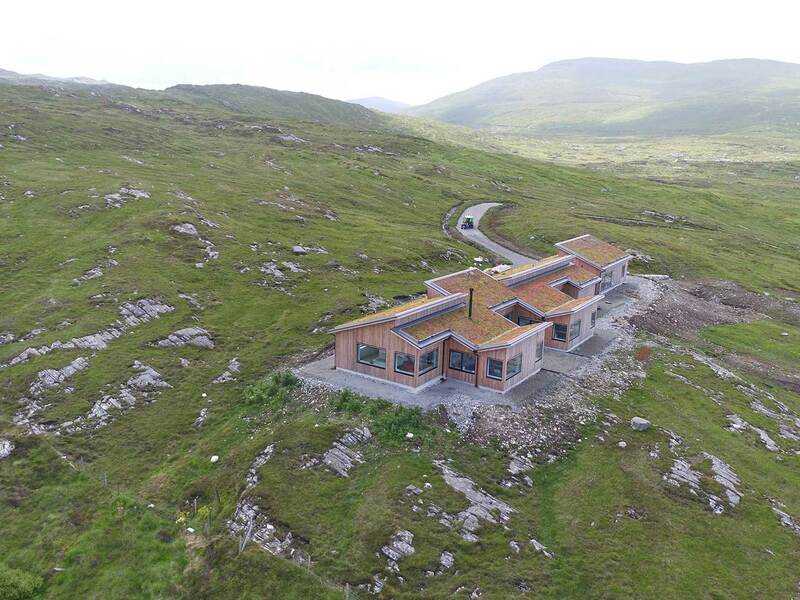 As part of their continued involvement with the now completed project, a drone operator, based on the island, has been contracted by Bridgman & Bridgman to take monthly aerial images of the roof area and send the images back for roof monitoring and wind up-lift checks.